Unique-Desire: Swatches: All of my NYX eyeshadows! 1. Africa is a bright orange based red, its a very pretty color. It has great color payoff and has a smooth texture. It has a matte finish. 2. Sunrise is very similar to Africa. It is a dark pink based red with yellow & orange glitter, though you can't see the glitter in the swatch it is there. This also has a matte finish. 3. Cherry is a red based pink. I bought this color because Marlena from MUG said it was a good red shade, I was very disappointed to find that it was PINK. lol But it still is a nice color, it has a slight frost finish. 4. 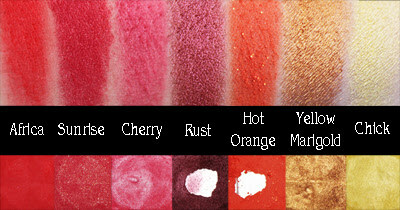 Rust is one of my favorite NYX shadow, it is a dark burnt red with a metallic finish. It is smooth and very easy to work with. A little will go a long way with this shadow. 5. Hot Orange is a bright orange shadow with yellow glitter. I really don't like this color(contrary to what it looks like xD I have used a lot of it back when I didn't have a good orange). It is chalky, chunky, rough, hard to work with and has bad color pay off. I had to swatch it five times to get the consistency you see above. I would say to defiantly skip this shadow. 6.Yellow Marigold is a gorgeous burnt yellow/orange with a metallic finish. Its almost a golden color. I really like this color, it is smooth, easy to work with and has great color payoff. 7. Chick is a soft pastel yellow with a frosty finish. This is a good shadow, nothing bad about it, I'm just not a huge fan of the color. So I personally don't use it much but it is a good shadow, very smooth and easy to work with. ﻿8. Lime Juice is one of my favorite colors, it is a yellow based lime green. I love it, it has a frosty finish, easy to work with, smooth, and has pretty good color payoff. 9. Lime Green is not lime green. It is more like a muted grass green to me. Its blue based. It has the same finish and texture as Lime Juice. 10. 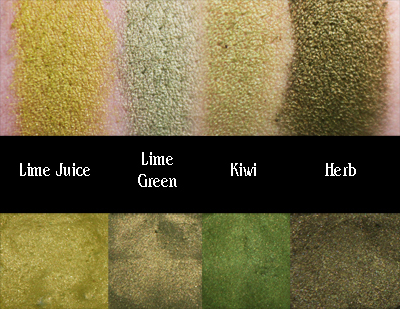 Kiwi is a gorgeous grass green color. It has the same texture as the other two but the color payoff isn't as good. 11. Herb is another one of my favorite colors, its a brown based olive green. Its pretty dark, but super pretty. It has a metallic finish and a smooth texture, very easy to work with. LOVE! 12. Sweet Lagoon is another one of my favorites. Its a very light grey sky blue. It is smooth, soft, and easy to work with﻿. It has a matte finish and is perfect for blending out darker blue colors or as a highlight. 13. Aqua is a gorgeous soft blue with a purple base. It has a slight frosty finish, very easy to work with. It has a similar texture as Lime Juice. 14. Ocean is a gorgeous turquoise color. It leans more on the blue side and it is darker than the average turquoise. It has a frosty finish & has a similar texture as Herb. 15. Jungle Fever is a green based jade, its very light and pretty easy to work with. I haven't used it much, maybe one or two times. I'm not really sure why, but it is a good color. 16. 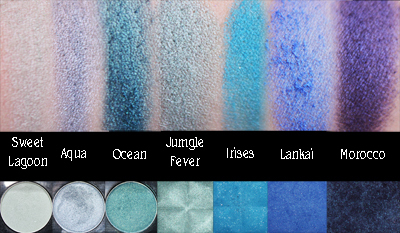 Irises is one my faves, it is a bright baby/turquoise blue. It has a matte finish with glitter chunks in it. Its not the most opaque color but I don't have another color like it, which is why I like it so much. Its very easy to work with and has a similar texture to Sunrise. 18. Morocco is another one of my favorites. Its a gorgeous blue/purple with a metallic finish. The more you blend it the more purple it looks. Its very easy to work with and I absolutely love it. 20. Deep Purple is a darker version of Purple with a slight more blue base. It has the exact same texture and works the same. 22. 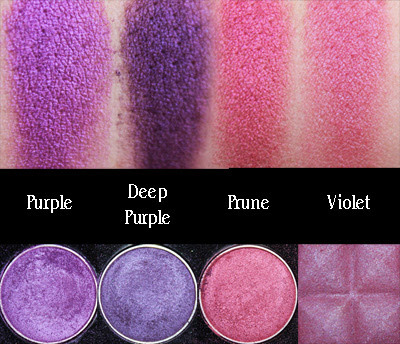 Violet is a darker version of Prune with a different texture. It isn't as opaque and it is harder to work with. I personally NEVER use this color and probably never will. I would opt for Prune before I pick up this color. 25. 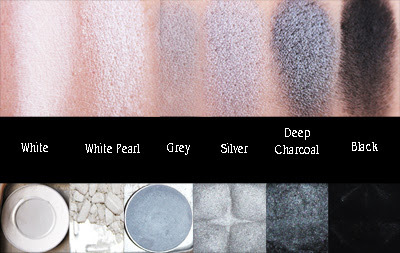 Grey is a light matte grey, it isn't very opaque but it is perfect for blending out smokey looks. 26. Silver is a light blue based silver, its about average texture. Pretty easy to use, not a bad silver, but not great. I like the one in the 120 palette better but this is a good substitute. I wouldn't cross this off your list. 27. Deep Charcoal is a gorgeous color, it really does look just like charcoal. It is a dark grey with a metallic finish. It has the same texture as White Peal, Morocco, Herb & Rust. 28. Black is just what the name is, black. A very dark, very matte black eyeshadow. I love this color, I use it almost everyday in the outer v and lower lash line. And it's perfect for smokey looks, the best black I have used yet. And I did two looks to show them in action. In this I used Lime Juice on the lid, Purple in the crease, Deep Purple in the outer crease, Black in the outer v, and White as a highlight. Hey I loved this! It was super helpful! I just got a few new NYX eye shadows the other day and I loved them. I didn't see them in your list and thought maybe you would want to check them out (: Exotic Green, Sweet Oleander, Frosted Ocean,and Champagne. - they are amazing colors, and I think you'd really like them! Wow, thanks for taking all the time to put together this post. Very helpful and definitely going to be purchasing some of these shades. Loved this and I really like the way you describe the colors AND textures. This page is GREAT!